If you are going to be in HK between now and Sep 16th I suggest going to Tsim Sha Tsui Harbor City and check out the 100 Years Before the Birth of Doraemon exhibit. It is something unique to celebrate the countdown of Doraemon's birth. Doraemon is a future robot cat from the year 2112 and Sep 3rd 2012 is exactly 100 years before Doraemon is born. 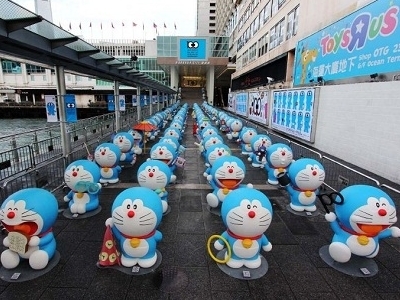 The exhibit will showcase 100 different life size Doraemon with 100 futuristic secret gadgets. “The Night Before Nobita’s wedding!"